A portrait session tends to be incredibly stressful for parents, especially for Moms who understandably want things to go well (I’m trying really hard not to say “perfectly”, but it often does seem that way!). And when stress levels are high, paired with solid expectations of good behavior, finding patience when dealing with your children can be really hard. We often forget what it’s like to be little. To have someone else dictate what we do on a daily basis. And to have literally no power over anything. A new surrounding, a stranger, and parental expectations can combine to make a fairly stressful situation for children. So before you decide that your child has gone completely off the rails, picture what it’s like from his perspective! Often that will give you important insight into his world and conjure up patience you never knew you had. Before raising your voice or vocalizing a command, take a few deep breaths. This allows your body to calm itself so that the situation doesn’t get escalated. This is also something I often ask children to do in front of the camera, as well. After the deep breaths, explain your thoughts calmly and try to be gentle - we all know how hard it is to keep composure when little kids are involved! Sometimes it’s better to let someone else handle things. As the photographer, I am always there to take charge of the situation. While I don’t need anything resembling good behavior from a child, I do insist that everyone is safe during the session. So if a child takes things a little too far, I step in fairly quickly. The biggest hurdle for parents, in that situation, is letting go. We all want to help out and try to fix the situation, but sometimes it’s better to let someone else handle it! We all strive to be perfect parents. We want our children to be a reflection of that, in every way. But a portrait session is one of those unique circumstances where you really can’t predict how a child will behave. They might get unusually shy or start being overly silly.. they might even act completely unlike themselves! It’s a new situation and everyone is trying so hard to please. Giving yourself the permission to not be “a perfect parent” is incredibly important. And I will be the first to say that I have some challenging children! My two boys have performed every imaginable childish act known to man.. and there is nothing that can happen at this point that would surprise me. There is no such thing as perfect children, and I feel the same goes for perfect parenting, too. We often prescribe timeout for kids (which may or may not actually be effective), but taking a timeout yourself is often a much better approach. Stepping away from the situation allows you to calm down and regroup instead of reacting. And during a photo session, you’re often able to do just that. While the Studio is small, there is a very comfortable couch to hang out on, play a game on your phone, or simply look out the window. 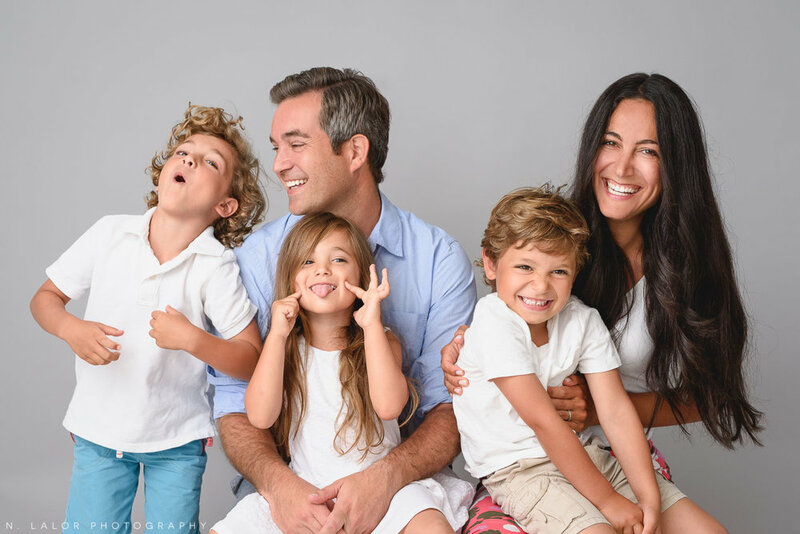 When you hire a professional family photographer, the big benefit is that we’re usually well versed in working with children, so you can sit back and relax without worrying about directing your child. And trust me, if you say “Mommy is going to take a time out now” to your child, you’re going to get a pretty awesome reaction! We all have the same goal. And believe it or not, all your children want is to please YOU! That’s why it’s so important to give them some space - some room for them to be able to express their personality without reprimand. And it’s equally as important to be a bit more patient with them during this time, too.